Biscotti Dress is a brand that boasts of classic silhouettes dressed in small twists. This long-standing brand was founded in 1986 and is based in the sunshine state of California. Each creation is made to last with quality fabrics and timeless style. the fall and winter collection offers warm fabrics for the cooler temps. 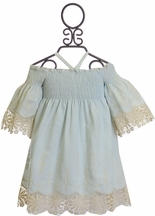 A dress for any little girl is a special event and is one that she will remember years later. tulle, rosettes and beading are a staple on most Biscotti dresses. With the featured fabrics be sure to look for the special details that set every holiday dress and special occasion outfit apart from others. She is sure to feel like a dream. Every design from Biscotti is made to capture her heart and make her feel as beautiful as she already is. A testament to their masterful quality and looks, dresses have been worn on at Hollywood�s red carpet events, and even by Malia Obama on election night 2008. This luxury girls brand is loved both here in the states and internationally. Every design is easy to style for family photos or special events, which moms adore. A sister line to Kate Mack is the sophisticated look that even the first family cannot deny. Whether you are looking for an outfit to kick off a school year or a timeless dress for the holidays, Biscotti is one of the top picks across the board. The designers love to take simple and turn it into simply amazing. while some brands have dry clean only for their special occasion dresses, many of the pieces you find from Biscotti are either machine washable or hand wash. When you think of a Biscotti dress, you think of elegance, beauty and a style above the rest. When a young girl wears their dresses, she feels like a one-of-a-kind gem and will see life through a stained glass lens, lending magic and wonder to her night. the Fall 2017 collections did not disappoint longtime fans, each one focusing on delivering on fashion your daughter will be eager to show off and accessorize. The most popular dress from the season comes from the �rose rhapsody� collection. The girls red holiday dress will stand out no matter where she wears it and will make her feel like a queen. The bodice is covered in crawling scrolls, beautifully romantic. A real eye-catcher, the dress features a jeweled waistline that ties into an adorable bow on the back. Lighting up the smile on her face, the glitz and glam collection has brought us the marvelous �sequin dress with ruffles.� this dress is heavenly, simply put. The light rose pink shade is elevated with the thousands of sequins that cover the piece. This holiday gown opens into a twirling tulle skirt, bringing to life the ballerina inside of every small girl. Sequins as far as the eye can see, both the "light pink sequin dress for girls� and the �Biscotti sequin top with tulle skirt in pink� deliver on a brand new look for the holiday season. Passing on the traditional colors of red and gold, these shimmering pieces bring fresh splendor to her holiday parties. The sequin dress is also perfect for your holiday photos, sure to bring nostalgia as the years pass. The �royal treatment� collection holds creations that call out to your sweet daughter�s imagination. Whether in gold or silver tones, these holiday dresses were undoubtedly made for a princess. Floral overlays and waves of tulle are the stars of the silhouette. Delightful and dazzling, dresses as wonderful as these call out for accessories that are just as lovely! For looks that are a little more casual, look to the �bright accent� collection. these styles are made with bold black, white and candy pink. The fabrics are soft to the touch, and comfortable for all day wear, even at school. The blocks of color make accessorizing easy and fun. Another casual collection, �flower flair� holds a since of whimsy that reminds of the enchantment we felt during the stress free days of childhood. It reminds us of running through the garden, playing hide and seek, and reading up in a special nook of the house. The bottom line to this wonderful brand, is once you purchase your first Biscotti girls dress, you will not be able to wait until you find a second. The quality of the components and the wonder filled designs speak to our hearts and will look astonishing at any event.